This website aims to showcase my two historical research interests: family history (in particular my study of the history of the surname Grannum) and Caribbean genealogy, history and heritage. I have been been researching my English and Bajan ancestry for over 25 years. 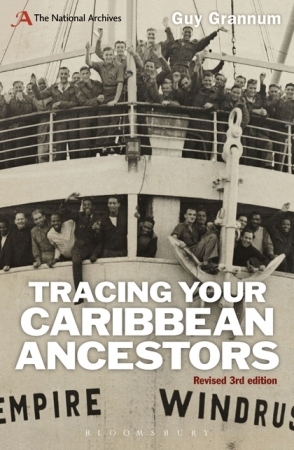 I have published three editions of Tracing Your Caribbean Ancestors (Bloomsbury, 2012); earlier editions were published by the Public Record Office as Tracing Your West Indian Ancestors. I have written several articles on Caribbean and African-Caribbean genealogy. Since 1993 I have given many talks and workshops to archives, family history groups and libraries in London, the Midlands and the South West on sources in the National Archives, genealogy in general, and Caribbean genealogy. I give talks and workshops for library and archive services and family history groups. I currently have three presentations: Caribbean family history; Caribbean migration to the UK; and Caribbean participation in the First World War. I have been a tutor for Pharos Tutors since 2010 running a 5 week online course on Caribbean Family History and 3 week online course on how make best use of the National Archives’ website and catalogue. Tracing Your Caribbean Roots: A National Archives Guide (Bloomsbury Publishing plc, 5 September 2012). Caribbean Roots: An introduction to tracing your Caribbean ancestors, 20 pp (Caribbean Roots, February 2012). A booklet aimed at complete newcomers to Caribbean genealogy describing how to start their family history. Now on this blog. Harnessing User Knowledge: The National Archives’ Your Archives Wiki, in A Different Kind of Web: New Connections Between Archives and Our Users, ed Kate Theimer, Society of American Archivists (2011). Caribbean Migration to Britain, Your Family History, November 2010, pp23-27, history of Caribbean migration and sources available for researching Caribbean migrants. Taking it further: Find Caribbean Slavery Records, Who Do You Think You Are? magazine, May 2009 (issue 21), pp18-19, accompanying the article on Ainsley Harriott. Family History Detective: Records of slavery, Your Family Tree, February 2009 (Issue 73) pp46-49. African-Caribbean Genealogy, in The Oxford Companion to Family and Local History, pp26-33, ed David Hey, 2nd edn (Oxford University Press, 2008). Your Archives: an online community of record users, ALISS Quarterly, vol 3, no 2, January 2008, pp38-42. Republished with updates in RecordKeeping, Winter 2008. Sources for the study of the Transatlantic Slave Trade and Slavery at The National Archives (2007) essay for Adam Matthew’s digital resource Slavery, Abolition and Social Justice 1490-2007 – this is a subscription site. The Chains that Bind, Family History Monthly, August 2006, pp36-39, tips and resources for researching Caribbean slave ancestry. Caribbean Connections, Family History Monthly, February 2006, pp26-29, history of Caribbean migration to the UK. Tracing Your British West Indian Ancestors, Family History Monthly, April 2006, pp41-44. Tracing slave and slave owning ancestors in British Caribbean countries, Journal of One-Name Studies, vol 8, issue 2, April-June 2003. Tracing Your West Indian Ancestors (Public Record Office Readers’ Guide) (second expanded edition, PRO Publications, September 2002).